Image quality testing is no easy task. 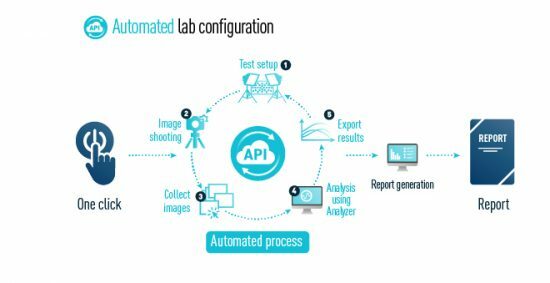 From image capture right through to analysis and report generation, the testing process needs to be comprehensive and should be automated as much as possible to ensure maximum flexibility. Analyzer 7 provides increased customization and automation of the testing workflow, as well as greater compatibility with DxOMark tests. Other improvements include the ability to process DNG format images, and to measure 16-bit images for radial MTF; and faster and more reliable lighting control. Lab scenes need to simulate real-life complexities such as motion, and taking measurements needs to be effortless and rapid while maintaining a high level of accuracy. Composed of a Moving Background and an automated Defocusing Object, the Automated Moving Object (AMO) by Analyzer addresses both of these points, and can be used in testing AF, motion blur, noise, texture, white balance, etc. Image quality testing can be tedious due to the sheer number of shots needed, and because of the inflexibility of the testing tools. Workflow Manager from Analyzer 7 allows you to customize and automate your image quality testing workflow. Perceptual analysis complements quantitative measurements to provide a complete assessment of image quality. A lab-based testing protocol provides repeatable testing scenarios for reliable scores. Simulating many real life indoor & outdoor conditions, Analyzer 7 provides a comprehensive testing setup for a wide range of perceptual analyses.